This sh3.exe patch will give you the opportunity to make the draggable chronometer at G3F menu to be not only repeater, but to be fully functional. The patch will work on original sh3.exe, will work after H.sie patch, will work after H.sie patch plus Stiebler add-on, and will work after my TychoSh3Patch. Will not work directly with Steam version! Steam users must first apply H.sie patch. To install it, first extract the ChronoPatch folder from the archive, copy and paste your sh3.exe file in this folder and then start the file "ChronoPatch.bat". Copy and paste the patched sh3.exe file back to the game folder or in mod folder for JSGM install. The patch itself will not give functional draggable chronometer to the end user. 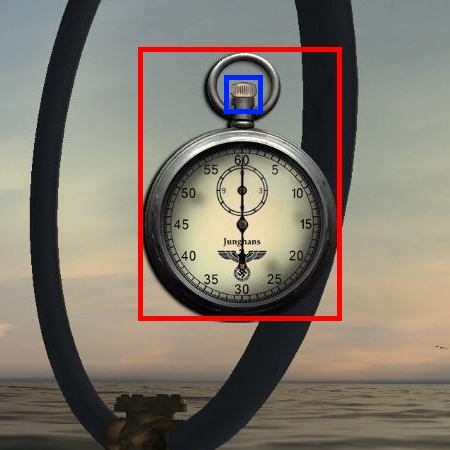 You can do it yourself or wait for gui modders to rework their draggable chronometers. Basically, you need to add in menu_1024_768.ini, one Type=1031 item to the G3F menu with the specific ItemID=0x3F310005. It can be everywhere, but of course is more suitable to be part of the draggable chronometer. If your chrono have separated graphics for glass above the arrows, you can make the glass element to be 0x3F310005. Or, you just add new one, after draggable item. It is not needed to have graphics (without "Mat 0="), just right "Pos=" for dimension and position. And after my patch, when you click over this item, the chrono will start, stop or reset. The draggable will be what is left of the red area, and the blue area will be for activation of the chrono. This version is without ticking sound outside of the scope screens. I can make the version with the ticking sound, but for now this have some problems. Because, in the game code have three functions, that works with this sound and this interfere with my one. In the future, if I come with solution will release a new version with ticking sound. Well, the situation is that I'm out of SH3. I don't play and don't do anything. Don't have mood, my last campaign patrol is a year ago. Only from time to time I look and change something in the sh3.exe. But, some time ago, Makman ask me if I can make the draggable chronometer to be functional. You know, it is only repeater, and to start and stop it, you must go on periscopes screens. So, interesting problem, let's try to solve it. And I accomplished the task, now the chrono can be started and stopped from G3F menu, that mean from everywhere. Now, the patch is ready by a month or so, tested by me and Makman, work like intended. But, I still don't find the mood and time to sit and release it, to write readme file and explanation. So, I was thinking, if I post this topic, then I will feel obliged to finish all the job needed, in manner of day or two. Will not happen today, I'm at work now. Last edited by Tycho; 11-13-2018 at 07:17 AM. Sweet! I'll give it a go once I am home! Thanks for your hard work! Explain the installation method. Show an example of how many changes are waiting for me here:"Basically, you need to add in menu_1024_768.ini, one Type=1031 item to the G3F menu with the specific ItemID=0x3F310005." Send me yours menu_1024_768.ini, I will make it for you and will write example over it. A real useful addition to the game. Thanks alot! Now i have to find the final position for my new Stop-Button. I make this not on my computer with SH3, result is not checked, but must be right. 1. First I'll find the draggable chrono in this menu_1024_768.ini file sended me by Anvar, let's use the word "chronometer". 2. Found it: [G3F I400], if you don't find it with this word try with "0x3FF00000". I think that every draggable chrono in every gui have this ItemID, by inheritance from the first one made by Jonz. In this particular gui, graphics for the chrono is taken from the file "data/menu/gui/Periscope.tga". But, because this file contain many things, is used crop function, to take only the chrono. I open the Periscope.tga with Paint.net and I look over the Crop 0=digits. 1024 x 0.00292969 = 3,00000256, so 3 pixels from left to right. 1024 x 0.767578 = 785,999872, so 786 pixels from up to down. This is where cropping start, the next two numbers: are how many pixels will be cropping to the right and down from this position. In this case this is equal to the resolution of the chrono, I see this in: third and fourth numbers of "Pos=", 163x213. So, with this information I will crop it from the Periscope.tga with the Paint.net. 4. I did that only because I need to measure the right parameters for the "Pos=" of the new Item that I must add. so I will copy it and will paste it immediately after [G3F I400], and will renumber it to [G3F I401]. I make "Name=Activation" , "ItemID=0x3F310005" and "ParentID=0x3FF00000", and delete "Mat 0=" and "Crop 0=", don't need these. Now, over the graphics of the chrono that I cropped, I decide what will be the area for activation of the chrono, and will make the proper "Pos=" of the new item. 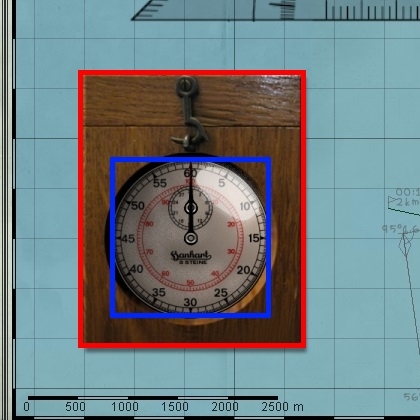 So, from the upper left corner of the chronometer the position will be "36,-79" and resolution will be 101,101. 5. Now, I need to renumber all of the rest of G3F items. Happily, the chrono is close to the end of G3F, the last item is [G3F I417], so I do it manually. I raised with one the number of every G3F item after my new one, so the last one come to 418. If the case was to renumber too many items, I would have to use the Hsie menu renumbering tool. 6. Finally, I apply ChronoPatch over sh3.exe, and now when I click over this new menu item, the draggable chronometer will start/stop or reset. Just like the original one on the periscopes screen. Last edited by Tycho; 10-11-2018 at 02:57 AM. In this particular menu_1024_768.ini, I did not pay attention to the chronometer position. It is hidden to the upper left corner of the screen. My Chrono-Patched sh3.exe (with H.sie patch plus Stiebler add-on, but not TychoSh3Patch), crashes almost immediately upon launching. Maybe my SH3.exe (with h.sie v16b1 and Stiebler4C) is different then yours. My version is from ftp:COMMUNITYMODS. Maybe, you do something wrong with all the steps needed? Take the original sh3.exe, move it to H.sie patch, patch it and do all needed by instructions there, but don't use option selector there. Next, move the sh3.exe to the Stiebler add-on, patch it and do all needed by instructions there, now use the option selector here to setup it. After that, move sh3.exe to the ChronoPatch, and patch it, of course menu_.ini must be edited to prepare the chrono to be functional. Now, the sh3.exe is ready to be send to the game folder. That is another great enhancement after your full nav map f5 and f6 for widegui ! I will try to place this functionnal draggable chronometer in ARB ahnenerbe wide gui for wac5 !